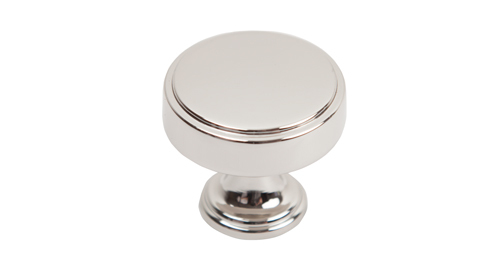 The Calgary kitchen cabinet knob has been made from high-quality nickel and has a beautiful polished finish. With a simplistic contemporary design and understated details, it is ideally suited to any contemporary kitchen. The smooth and reflective quality of the polished nickel not only looks great but feels great too. With a generous 40mm diameter and 37mm height, this polished nickel kitchen cabinet knob gives you plenty of space for your fingers, making opening kitchen cabinet doors or drawers comfortable and easy. If you are looking for a designer kitchen cabinet knob that has plenty of style without sacrificing functionality, the Calgary flat knob has to be your first choice.